Celebrated Mexican director Guillermo del Toro has a penchant for monster-making. The master behind Hellboy, Pan’s Labyrinth, and Pacific Rim has long shown a profound understanding of what monsters mean to us, and why we need them. The Shape of Water is his strongest work yet, brilliantly showcasing the unsettling reality that the monstrous can be revealed in a multitude of ways. In 1963, Elisa (Sally Hawkins) works as a janitor at a US government laboratory. One day, a strange, water-dwelling amphibious creature secretly arrives to the facility. Elisa is more fascinated than frightening by the mysterious creature. What seems to scare her more is the threat posed by the federal agent in charge (the brutish Michael Shannon). Cruel and self-serving, he seems convinced that the best way to handle the creature, which he hauled from a swampy jungle in South America, is to kill it. With the help of her neighbour Giles (soft-hearted Richard Jenkins), her co-worker Zelda (the films source of hilarity Octavia Spencer), and a sympathetic scientist (Michael Stuhlbarg), Elisa crafts an escape. The Shape of Water is filled with references to classic monster movies (upon first glance I’m reminded of Creature from the Black Lagoon) though the films strongest suit is its layered social critique. The film is set against a backdrop of the Cold War when fear runs high and African Americans are fighting for their rights in streets across the country. Guillermo brilliantly showcases the similarities of white-America’s unsubstantiated fear for the coloured community and the fear we have for creatures who look so otherworldly that we immediately consider them monsters. 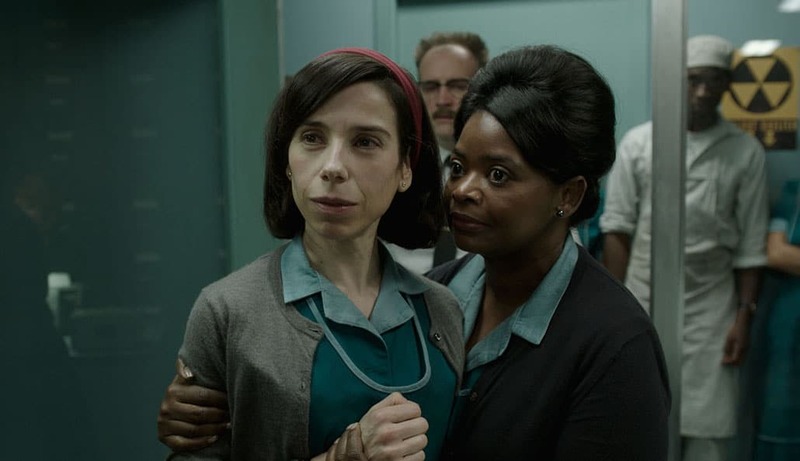 I was most impressed by Guillermo’s casting of three unlikely hero’s who in the 1960s represented the marginalized fringe; our heroine who overcomes adversity even though she’s a mute, her gay best friend who lives in fear of homophobia, and her coworker, a black woman who is consistently talked down to by her masogonistic and racist boss. The Shape of Water is a brilliant adult fairy tale where heroes are unassuming and the monsters we fear most, upon closer inspection, have powers to heal and offer hope.